I decided this wall in the great room needed something awesome. The thermostat and air intake just weren’t doing it for us. I decided the easiest way to keep this low cost was to use the frames I already had and find art to fit those frames, rather than coming up with a collection of art and then framing that. The bloggers over at http://www.younghouselove.com are veterans of the free/cheap/unique art, so I’ve taken some tips from them and started scouring ads in magazines and even the good ole Internet. I roughed them all up with a bit of sandpaper, except for a couple that had a lot of detail work on them. Then I ran all of them over with a nice coat of liquid deglosser. I let those dry for about 10 to 15 minutes, then hit them up with some Rustoleum white primer. 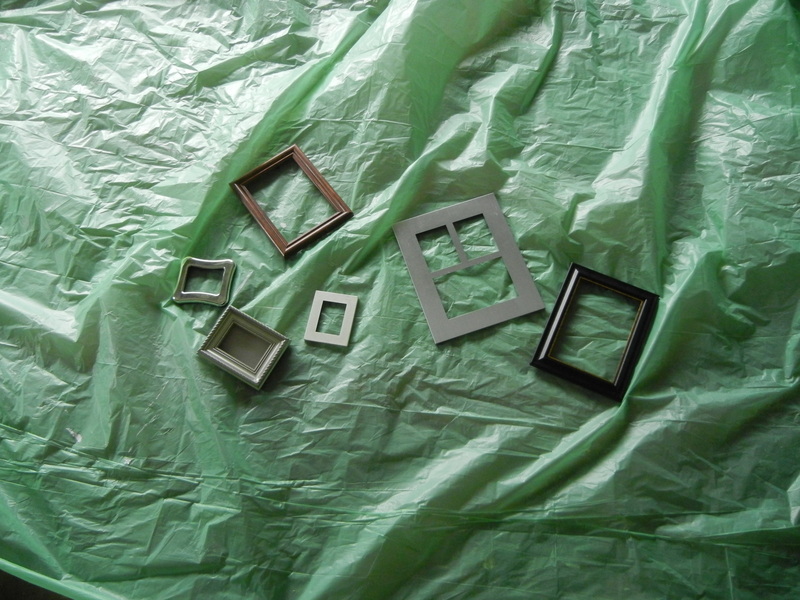 About half of the frames were metal, and I didn’t want the metal to have an adverse reaction to my paint. 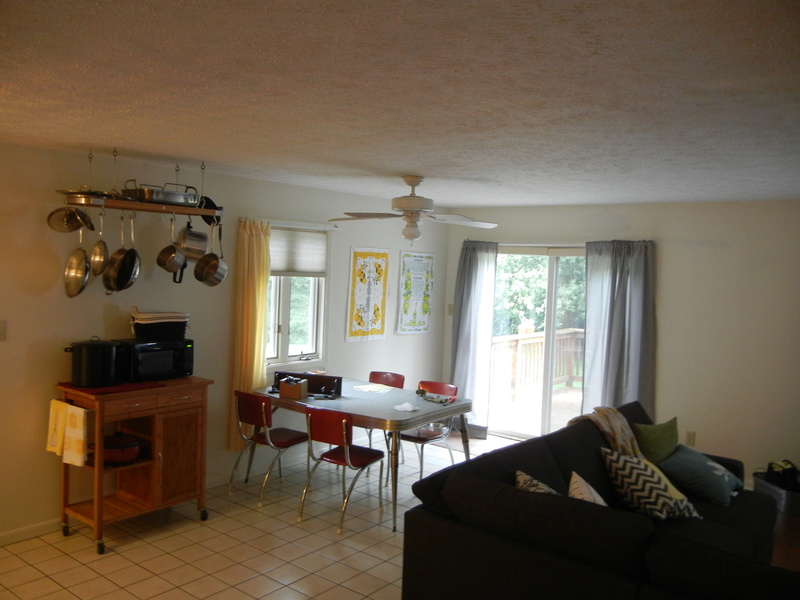 Then I hit them up with a few coats of Valspar Gloss Tropical Oasis (ironically the same color used on the stools I mentioned in the post about the great room … hmm … maybe we do need teal stools.) I love Valspar paint. I used it when I painted these lamps a couple years back. 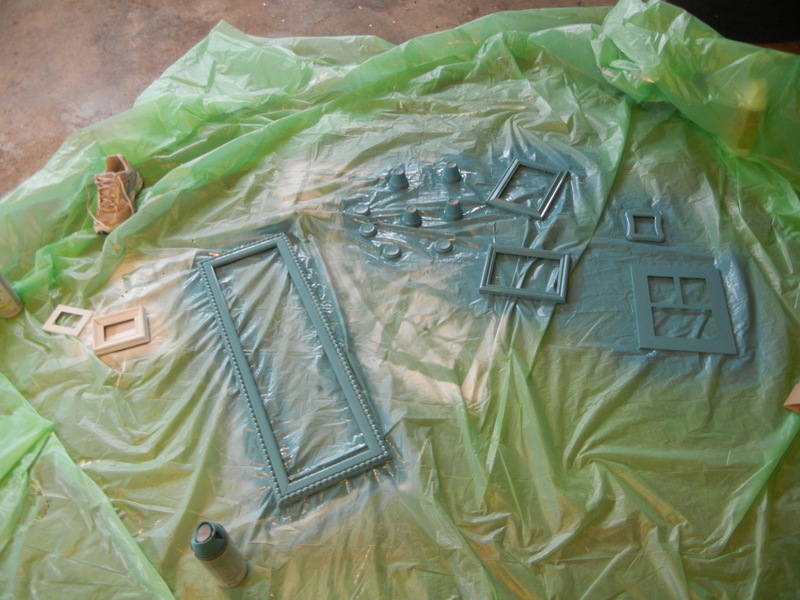 The paint goes on nice and smooth (the Rustoleum spray can was a bit … overly enthusiastic … shall we say.) With the lamps I just roughed them up and sprayed on a few good coats of Valspar in Satin Indigo Streamer (another color I adore.) They have held up quite nicely. Some day I might go back and hit them up with a coat of clear gloss, as they can be a bit difficult to dust. I forgot to take a picture when they were all white and clean-slatey. Just imagine them all primed and ready for endless possibilities. 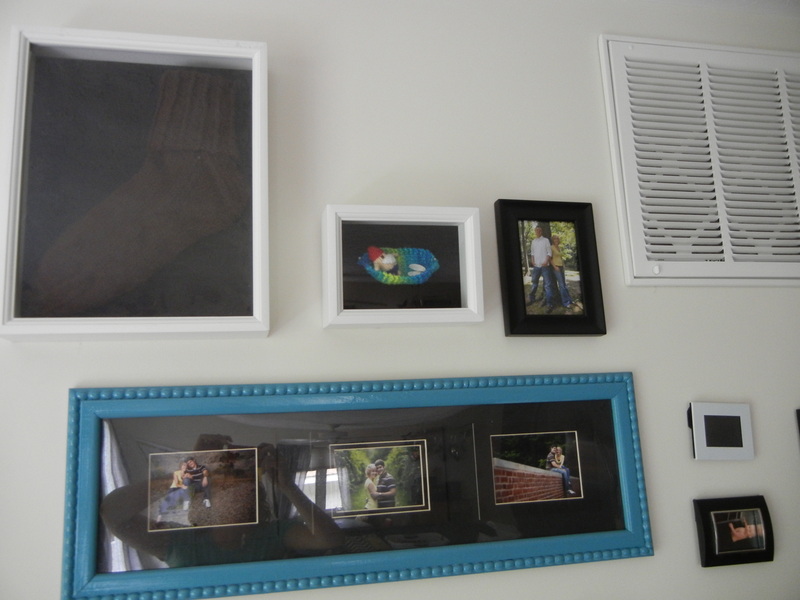 I had a lot of black frames already, as that was something I asked/registered for when we got married. I had two white shadowboxes. I decided to add a bit more balance by leaving a couple of the frames white. Rather than buying another can of spray paint, I primed them three or four times and then sprayed them with some clear gloss spray paint leftover from this project. The primer is pretty matte, but the gloss makes it look like it was actually a glossy paint. And I didn’t have to buy anything extra! Score. 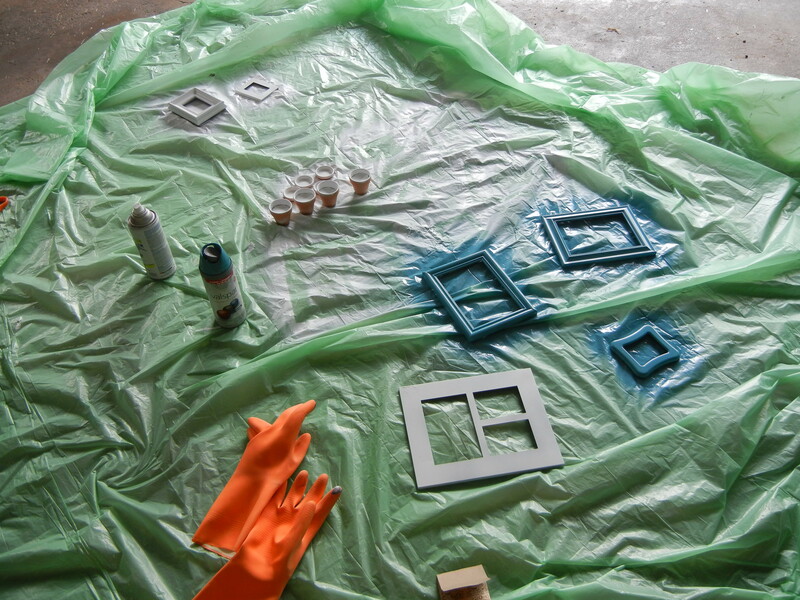 I primed all the frames before deciding which ones I liked in white and which I wanted to be teal. I left those suckers in the garage for about 20 hours to destink/destickify. After about three hours of drying they were pretty much done with the smelling, but I had time to leave them in the garage, so I did. I also just know that, had I brought them in the house, Tucker would have licked one or all of them. Earlier today he licked a doorframe and then a shelf that was laying on the ground. Nothing is off limits for this dog’s tongue. 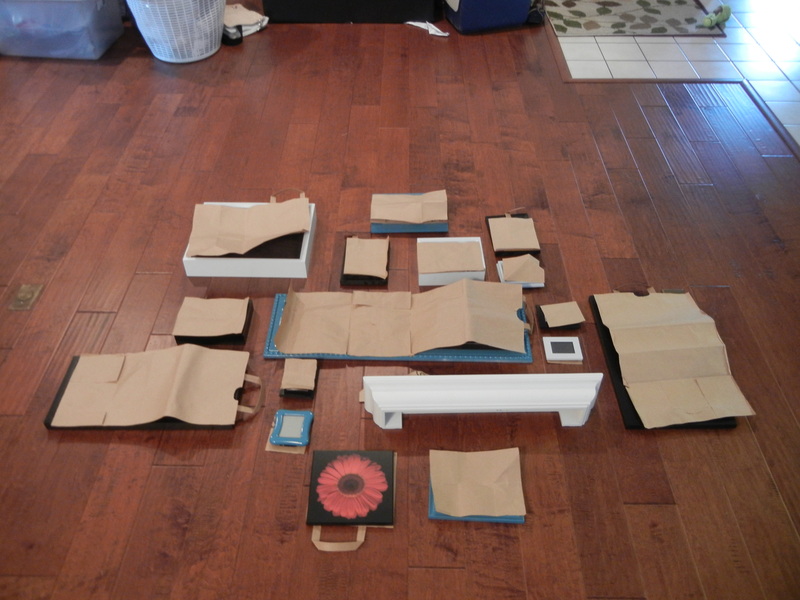 Once everything was painted and dry, I started laying them out on the floor. 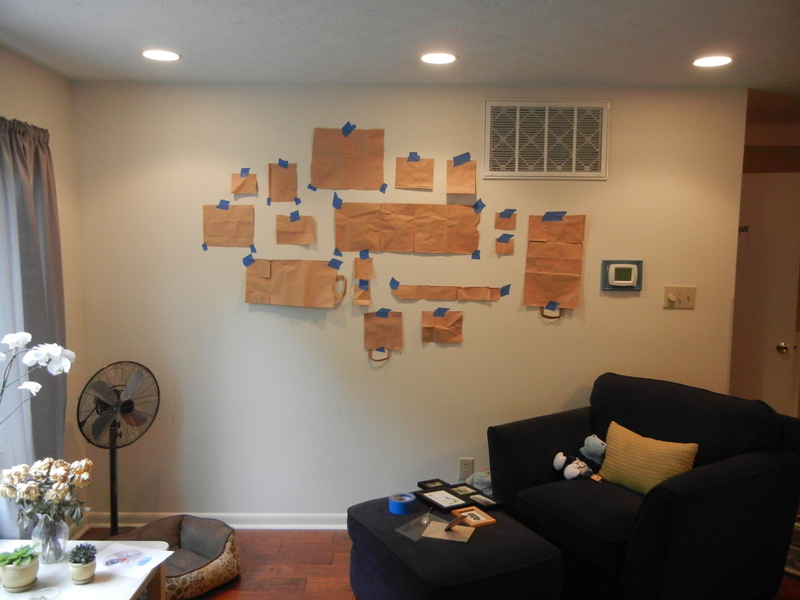 I had a thermostat and an air intake to deal with, so I also decided to make paper templates of all of them and used painter’s tape to lay it out again on the wall. I had to adjust a few things for the air intake, but overall it stayed pretty much the same. The next step was marking Xs on the paper where my nails needed to go. 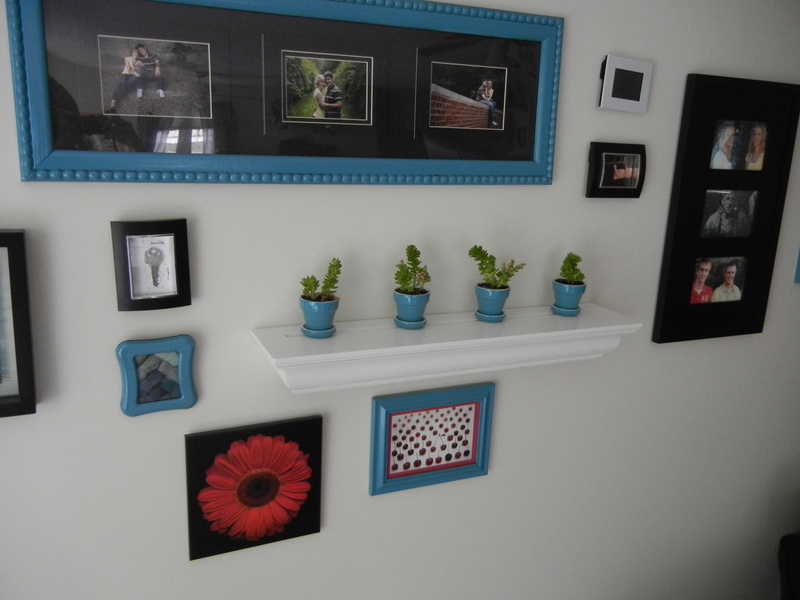 I used finishing nails for most of them, but I used drywall anchors for the large shadowbox and the shelf. Then up on the wall they went! Want to see my inspiration for this project? 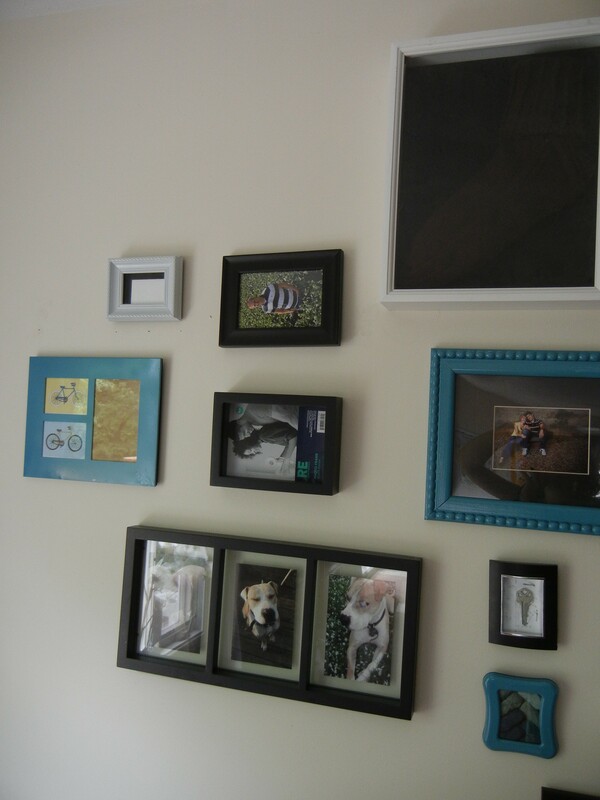 Check out my Gallery Wall board on Pinterest! 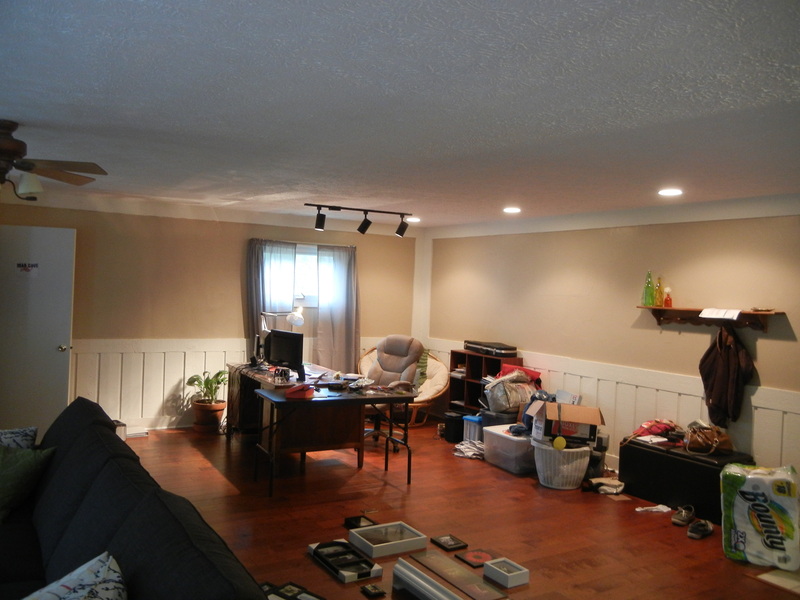 Well, it’s not perfect yet, but here’s an update on one of our favorite features of our home … the great room! 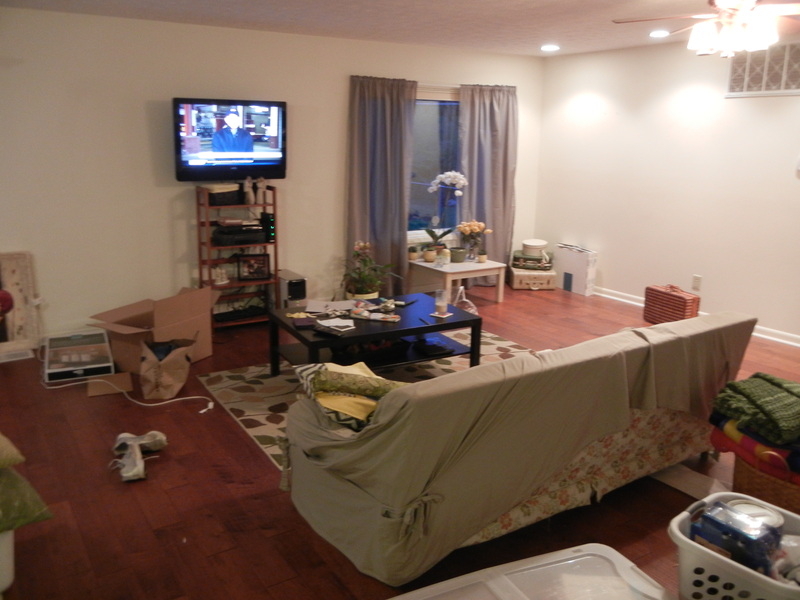 Here’s a nice before photo of when we just moved in. Oh how far we’ve come. And here’s the same view after a little bit of cleaning. Oh, and new furniture. Here’s the dining room portion of the great room. And finally the office corner! Don’t mind the big pile of Goodwill donations next to the bookshelf. So, of course there’s still a to do list. Here it is! Hang our large clock above the bookshelf behind the desk. Find some sort of piece of furniture that can adequately hide the mess of cords hanging off the front of the desk. Ugh. Some thoughts. This (two side by side in yellow with rice paper or wrapping paper or fabric or something attached to the backside of the glass) or maybe this. One piece of furniture would be ideal. I know for sure I would prefer something with doors or drawers. I would have some room to display things on top of it, and room to hide ugly office stuff behind said doors or drawers. I also really want a wicker chair to put in the corner behind the desk. The papasan chair is filling that space nicely for now, but I’ll keep my eyes open when I hit up the thrift stores this summer. I want to find some bins to go on the square bookshelf behind the desk, so we can hide ugly office stuff in it. I need to find some sort of art to go between the tv and the sliding doors. Oh, and that stuff needs to find a new home via Goodwill. I’m not in love with the light fixture above the couch. Find some solution to hiding the cords hanging down from the TV to the outlet. The bookshelf there helps, and I plan to put some sort of curtain/fabric backdrop between the shelf and the cords, but as some of the cords come out of the back of the shelf, I am going to have to get a bit creative. Find stools to go at the breakfast bar that don’t break the budget. 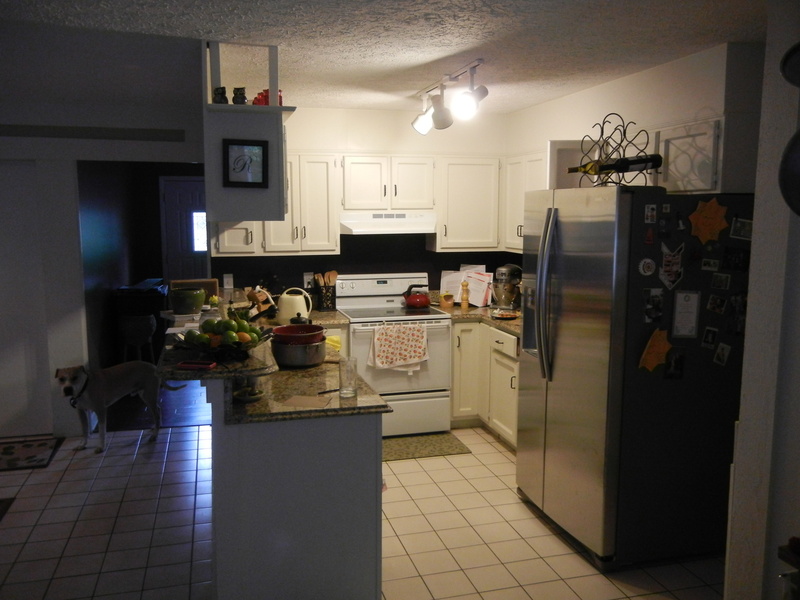 We’re leaning toward the stools they used in this blog. Not sure if we’d paint them or leave them in their grey metallic state. 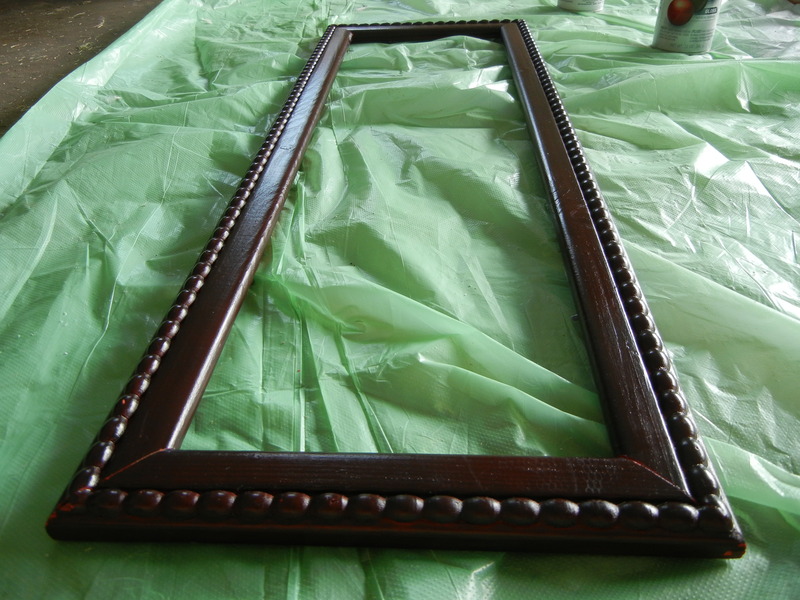 Hang tiebacks for the curtains on the patio doors and the picture window. The curtains now tend to get a) sucked out the door or to the screen or b) blown into the doggie bowls. We’re adding them to the picture window for symmetry. 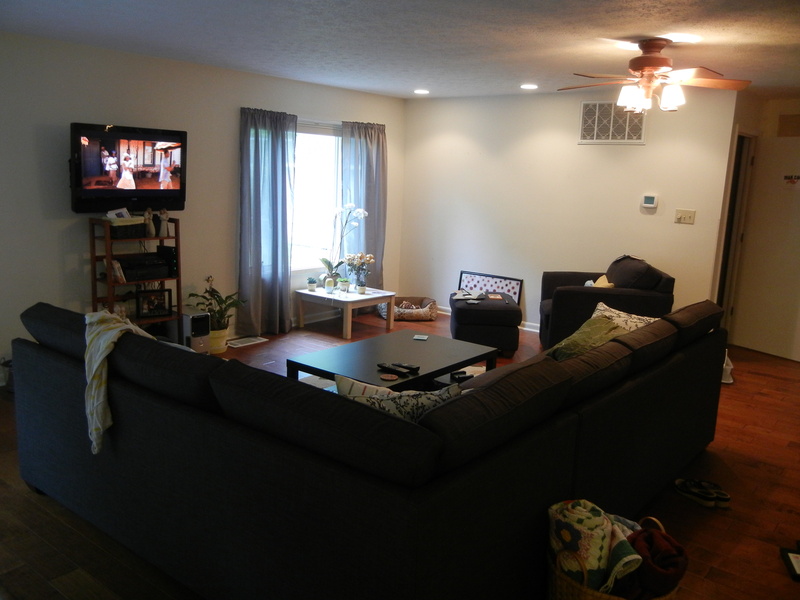 Find a new rug to go under the coffee table that matches the color scheme. Possibly DIY this from a remnant of carpet I own? So that’s it, as it is now! Want to see my inspiration for this room? Check out my Great Room Inspiration on Pinterest! This is something I kept seeing on Pinterest and finally decided it was time to try it out. 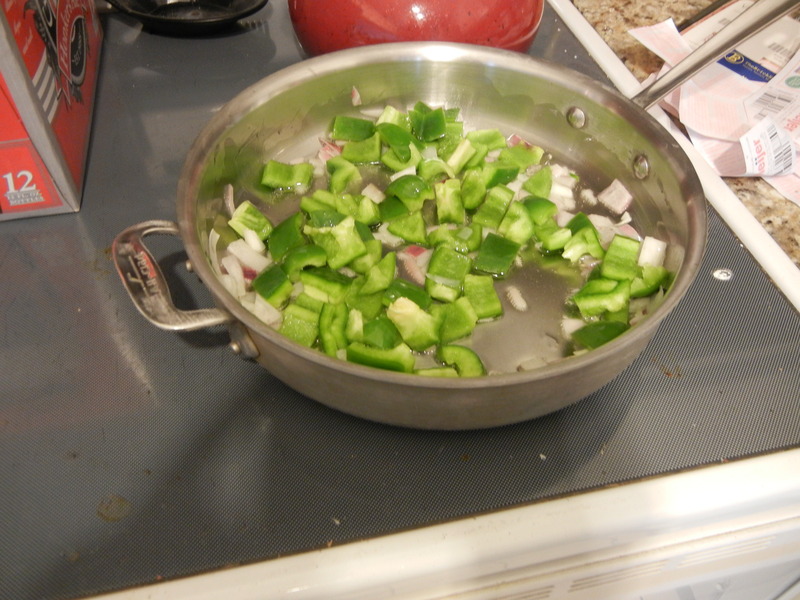 My first step was to lightly saute some green peppers and red onion in a bit of vegetable oil. 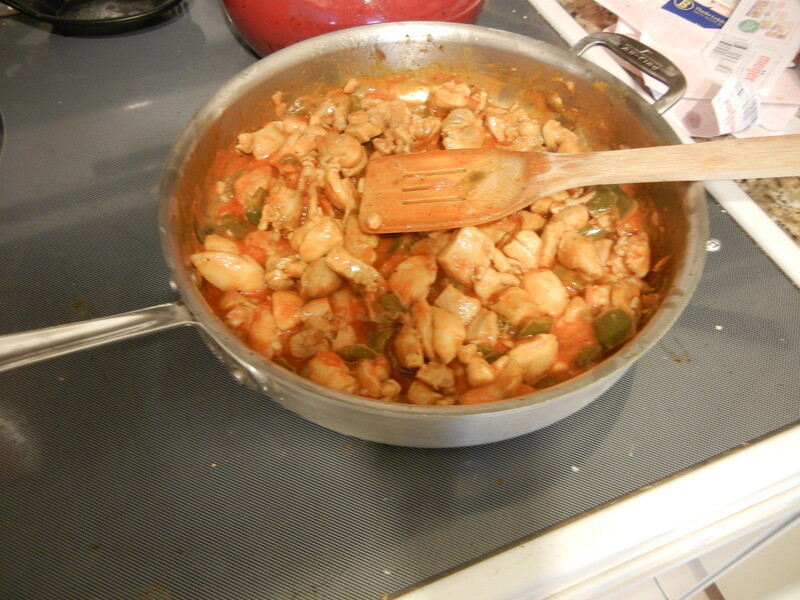 I then added my cubed chicken and continued to saute until the chicken was pretty much done. Once the chicken was sauteed I added buffalo sauce to coat the chicken. I didn’t want it to be soupy, but I knew we wanted it to be good and buffalo flavored, so I added a bit at a time until it was pretty well coated. In the meantime, I sliced up some french bread, lightly sprayed it with olive oil and lightly toasted it in the oven. 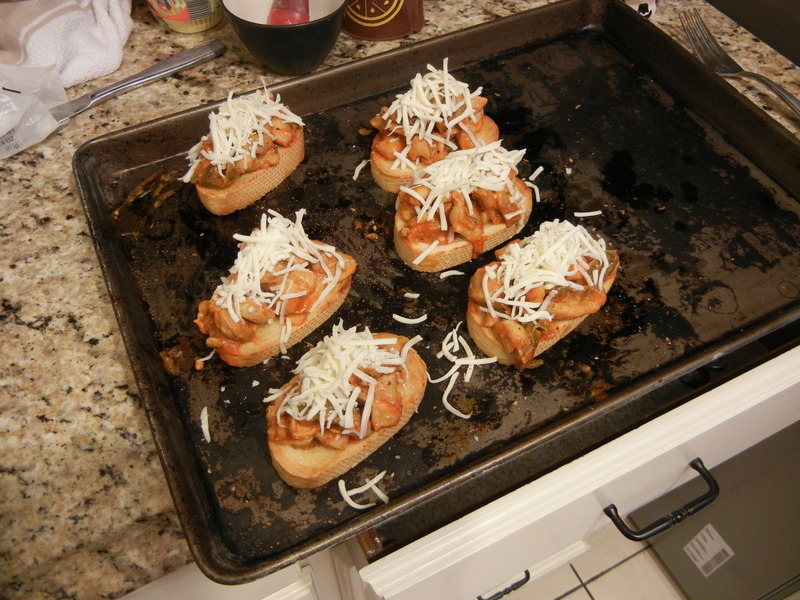 When the bread was toasted, I piled the chicken/pepper mixture on the side that had been down in the oven (the one that was more toasted), sprinkled some mozzarella on top, and put it back in the oven for a few minutes to get the other side of the bread more toasty and the cheese melty. 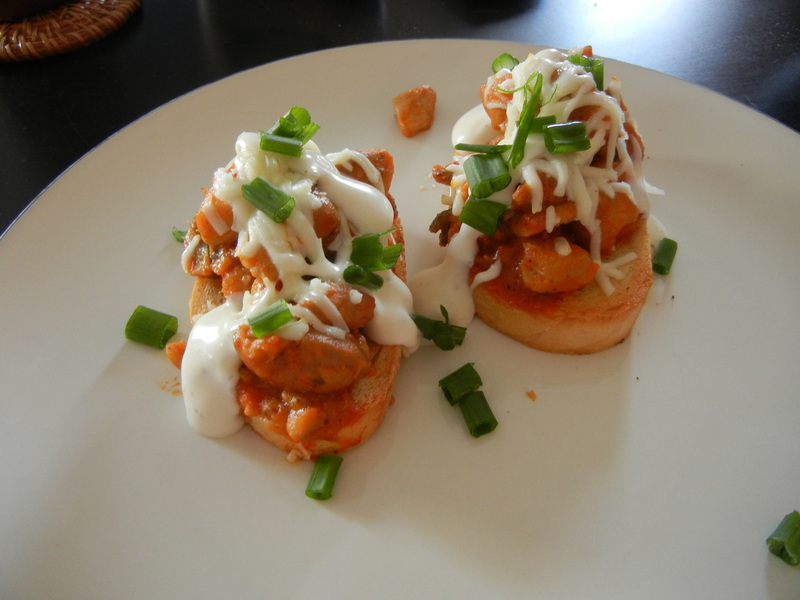 Once the cheese was melted, I plated the pizzas, drizzled them with ranch and sprinkled sliced green onions on top. They were delicious! Next time I make them I will probably put more green pepper in them, as they do tend to cook down quite a bit. I love Fogo de Chao’s parmesan pork. The other day I was surfing Pinterest and found a coypcat recipe. Last night we gave the recipe a shot! The flavor of the pork was fantastic. The marinade seems a bit odd, but is so delicious. 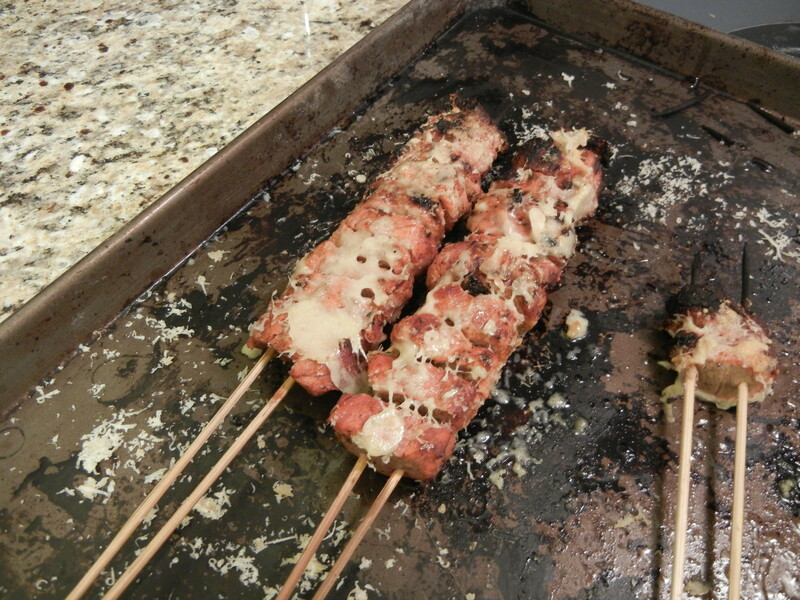 Some of the pieces turned out a bit dry, specifically the ones on the ends of our skewers and the smaller pieces. It suggests cutting the cubes as evenly as you can, but it’s a bit tough to do that since a pork loin isn’t traditionally square. All in all, definitely a recipe we will be using again. I think maybe next time we will try either cooking the loin whole and injecting some of the marinade or cutting it into medallions rather than small cubes to try to find a balance between maximum flavor and maximum moisture. A couple of changes, specifically to the parmesan part. I bought a block and grated it myself. The parmesan was pretty strong, and I didn’t use the full 5.3 oz block. I used about half of it, and it was plenty. I also didn’t leave it on the grill a full minute on both sides after adding the parmesan. I did on side for a minute and then just left it on the grill for a few seconds to get the cheese melty on the other, although the pork is still hot when you put it on, so that’s maybe not even necessary. Get loveinindy in your inbox! Time for a little cockpit nap on the way home. Flew over to #ourfavoriteplace at #towergrovepark for a picnic. @marisascurls I tried your refresh today and I need help! First picture is straight out of the pineapple. Second is still slightly damp, third is dry with a fluff. I lost so much volume! I think my curl pattern is more even, but it's so flat. It's also very frizzy, but I think that's because of the cut, not the refresh.